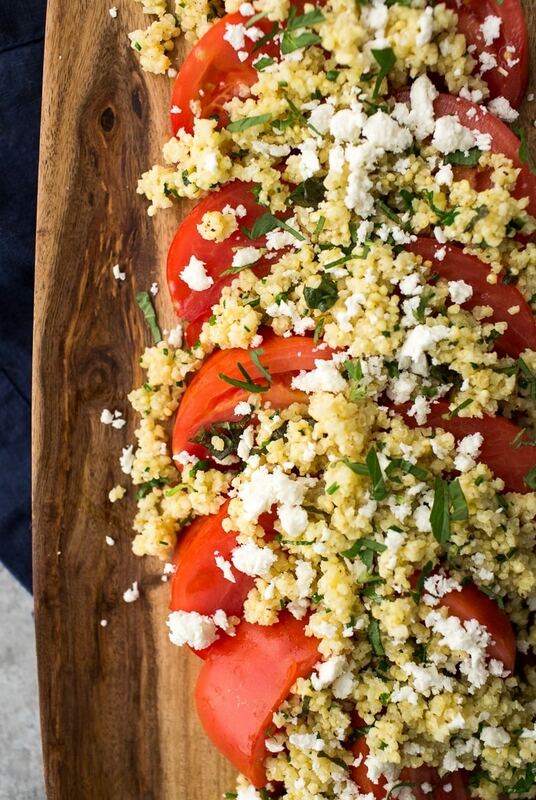 Herbed Millet with Fresh Tomatoes | Naturally. 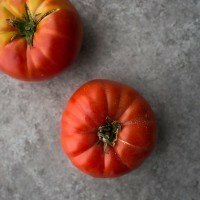 Even though summer is winding down, I’m still filling nearly every meal with tomatoes. I’ve cooked up pasta sauces, made salsas, and roasted tomatoes more times than I can count. However, a perfectly ripe tomato, in my mind, is best served raw. 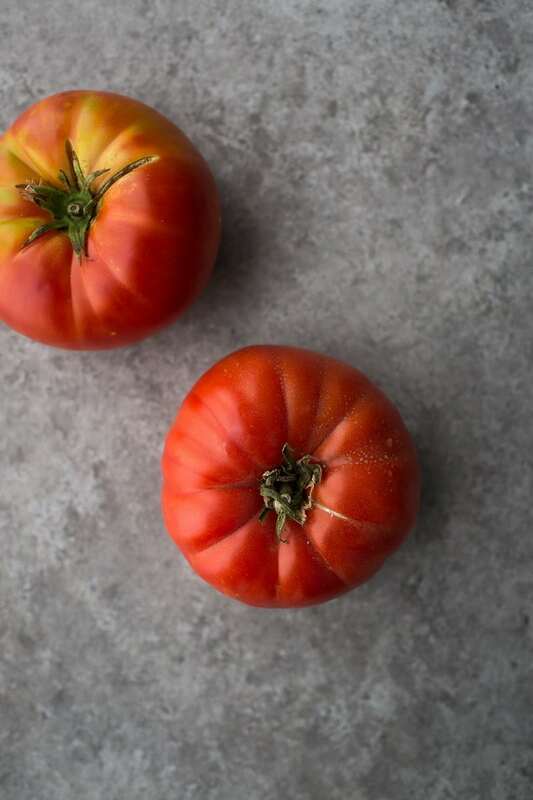 While I’m usually a traditionalist (tomato wedges with a bit of salt and pepper), adding herbed millet is a great way to dress up tomatoes. 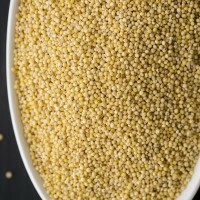 The low flavor profile of the millet is perfect for showcasing the fresh herbs and the taste of that ripe tomato. This side is a quintessential summer dish which lends itself to be paired with other summer dishes. Main: Stuffed Hatch Chiles. It’s about this time of year that hatch chiles start popping up in stores. These chiles have such a wonderful flavor and are definitely summer treat! Drink: White Wine (standard- it’s always my go-to. Preferably Pinot Grigio). Salad: Freekah Salad with Arugula and Corn. This salad has been my summer go-to. If you weren’t keen on having to cook up two separate grains, use millet or just leave it as a simple sweet corn/arugula salad! Dessert: Einkorn Crepes with Fresh Berries. Keep in simple! We always have crepes in our freezer for a nice dessert. Heat a medium stock pot over medium heat. Add millet and cook, stirring frequently, until toasted-3 to 4 minutes. Add in the water, bring to a boil, reduce to a simmer, cover, and let cook for 15 minutes. Most of the water should be absorbed. Let sit for 5 to 10 minutes until the remaining water has absorbed. Transfer millet to a bowl and stir in the fresh herbs, salt, pepper, and olive oil. 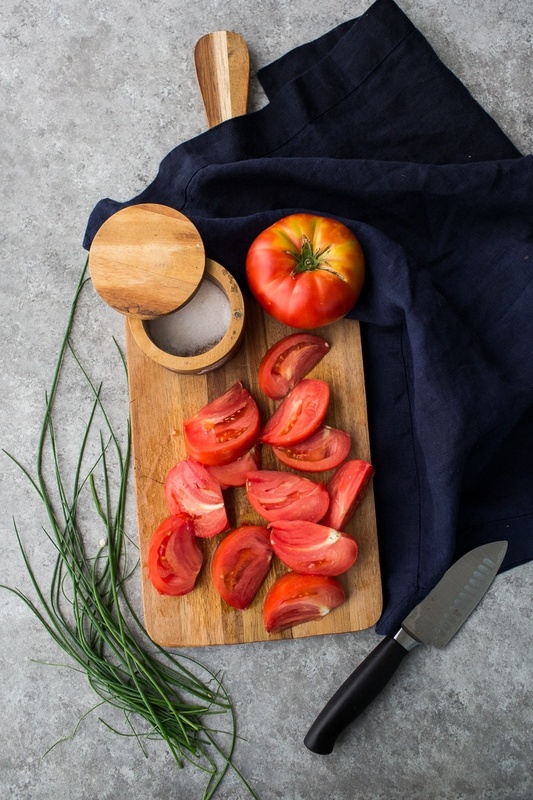 Cut tomatoes into wedges and top with herbed millet. Sprinkle with feta and serve. Don’t we just love it whenever we work with fresh ingredients? I’m absolutely loving those tomatoes! And of course the millet, it’s absolutely a wonderful addition to a vegetarians kitchen. I love that it’s gluten free, it’s rich in b vitamins, and loaded as well with folic acid, calcium, iron, potassium, magnesium and zinc. 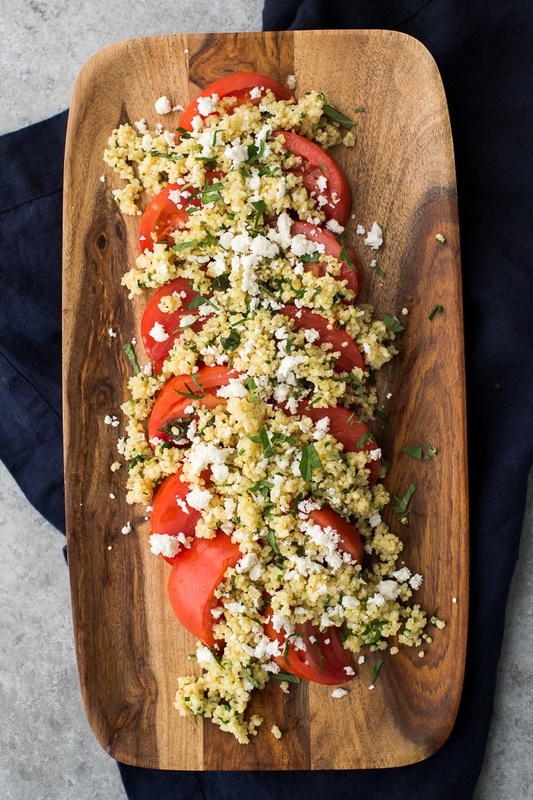 I absolutely love millet and this is a wonderful way to complement those big, luscious, juicy summer tomatoes. Gorgeous! Yum! This is going on my summer lunches list!